This years unmasking project is underway. There’s a story behind every mask and behind every mask there’s a person. 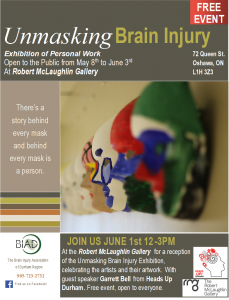 Come see these personal works of art on display at the Robert McLaughlin art gallery on June 1st from 12pm – 3pm. Go to the link below to get more details and to view last years masks.